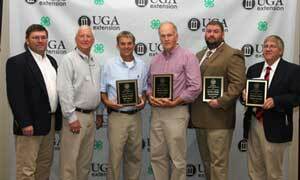 The Georgia Peanut Commission awarded county Extension agents recently with the Georgia Peanut Education for Excellence award. The awards are based on the complete peanut educational program over a three-year period for a county. Program examples include meetings, field days, newsletters, mass media, social media and result demonstrations.